A leak in a gas line can be a serious problem not just for one home but for an entire neighborhood as well. Even a small leak can be problematic with issues that range from dealing with the unpleasant aroma to health problems like headaches and even to the death of the birds and small animals that visit the area. That small leak can grow into a very serious and very large problem very quickly so it is always very important to deal with leaks as quickly as possible. Natural gas, which is most commonly used in residential homes for cooking and heating is odorless by nature so a chemical is added to make detecting leaks a little simpler. If you smell something that is a bit like rotting eggs or even like the faint scent of a skunk then you might have a gas leak. You can do a quick check of your stove controls to be sure they are all in the off position and check pilot lights to be sure they are still lit but beyond that, it is important to call the gas company for immediate inspection. Because a gas line leak may be far more extensive than originally thought it will also be important to call a qualified plumbing company as well. They will be able to assess the leak and more importantly, will be able to quickly repair the problem so that you are not without natural gas service to your home for very long. A gas line leak can cause an explosion with just the slightest spark to do not hesitate to make the call whenever a leak is suspected. This explosion can cause additional or chain reaction explosions and will result in fires that can quickly spread from one home to another with the potential of wiping out an entire neighborhood. 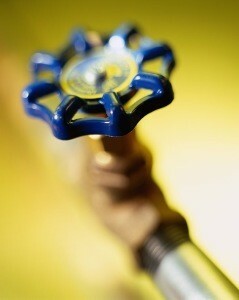 If a leak is detected that you are responsible for, call a qualified plumbing company for immediate assistance.